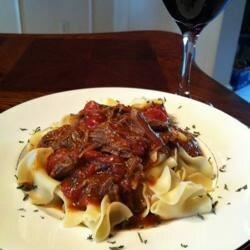 "If you are a pot roast enthusiast, this is definitely one to add to your collection. The meat is simmered in a tomato sauce, and served over hot noodles." Heat a Dutch oven over medium-high heat, and brown meat on all sides in hot oil. In large bowl combine tomatoes, pizza sauce, cheese, Worcestershire sauce, garlic, salt, oregano, and pepper. Pour over meat. Cover and simmer over medium heat for 2 hours, turning meat each half hour. Remove meat from pan, and cool slightly. Skim fat from pan juices. Measure juices, and add enough water to make 6 cups liquid. Return liquid to Dutch oven. Blend cornstarch and 3 tablespoons cold water; stir into pan juices. Cook and stir till thickened and bubbly. Slice meat thinly against the grain. Return meat to pot, and add mushrooms. Simmer for 30 minutes longer. Cook pasta in a large pot of boiling water until done. Drain. To serve, place meat slices over hot noodles, and pour some sauce over. Pass remaining sauce. This delicious pot roast is best made a day before serving. This took way too much time for the outcome. I didn't like it at all and neither did my husband. Wouldn't bother making it again. Definitely a make-again. Slicing up the cooked meat and returning it to the pot is key. I served it with mashed potatoes and veggies instead of noodles. My husband loved this! It had a great taste. I skipped the cornstarch phase and it was still very good. Made in in my crock pot. Came out a little more liquidy than I would like. Next time I'll be more diligent about the corn starch. Excellent just as written. Next time I may add some diced carrot with the mushrooms. Whole family enjoyed it, and it's a good choice for cheap beef. HOLY CANNOLI, this is some great stuff, didn't change a thing, reminded me of my mom's, NO LEFTOVERS...DRAT!